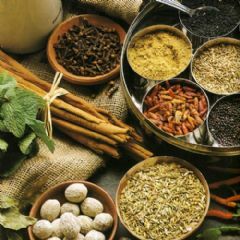 I read that Ayurvedic Nutrition encourages a diet with minimal protein from animal sources. In an earlier approximation of a vegetarian diet, I used tofu as a source of non-animal protein. This week, I added TVP, texturized Vegetable Protein. The package came with a recipe for chili, using TVP in place of ground beef or turkey, I guess. I've made non-meat chilis before, but I liked the texture that the TVP gave to this version. So did my family. I especially liked the reduction in cholesterol and fat that are characteristic of TVP. I'll be adapting some other recipes that I have, replacing ground turkey, with TVP.